Bono is "relieved" there is nothing "serious" wrong with his voice. U2 were forced to cut short their gig in Berlin, Germany, on Saturday (01.09.18) after the 58-year-old singer struggled with his vocals, but he's now consulted a doctor and told he'll be singing as normal again soon and the rest of the tour can go ahead as planned. He wrote in a statement on the band's website: "I've seen a great doctor and with his care I'll be back to full voice for the rest of the tour. So happy and relieved that anything serious has been ruled out. "My relief is tempered by the knowledge that the Berlin audience were so inconvenienced. "There was an amazing atmosphere in the house, it was going to be one of those unforgettable nights but not for this reason... We can't wait to get back there on November 13th." 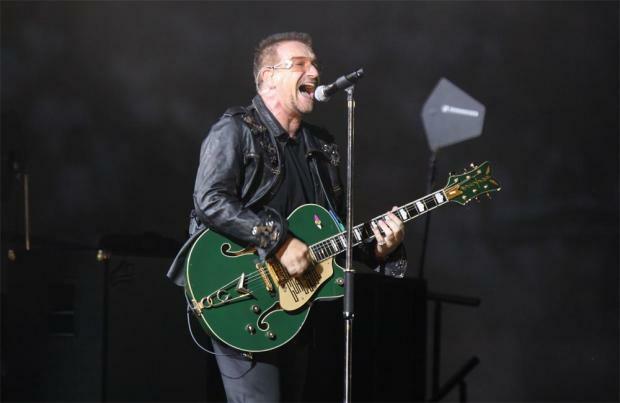 Bono had just performed 'Red Flag Day' in the German capital and was moving on to 'Beautiful Day' when he suffered problems with his voice and speculated that stage smoke in the arena had affected his performance. He said: "I can promise you I have not been smoking. But this is like a giant cigar. I've lost my voice and I don't know what to do... it was singing like a bird about 10 minutes ago." He asked for the smoke to be turned off and the air conditioning turned up, before suggesting a 15-minute break to try to resolve matters but the 'Experience & Innocence 2018' show was eventually axed. Bono told the audience: "I was ready to sing for you. Something's happened and I think we cannot go on. It's not right for you...I'm sure this is not a big, big problem but I'm gonna have to do something. So either, if people want to go home, that's fine. We'll play another show for you some other time. If you want to stay, we're gonna have to break for, I dunno, ten, 15 minutes. I'll go find out what's happening." Bono's bandmates Adam Clayton, Larry Mullen and The Edge later posted a message on the band's website. It said: "We're so sorry for tonight's cancellation. Bono was in great form and great voice prior to the show and we were all looking forward to the second night in Berlin, but after a few songs, he suffered a complete loss of voice. "We don't know what has happened and we're taking medical advice. "As always, we appreciate our audience's understanding and all our fans' support in Berlin and those who travelled from afar. We will update you very soon."